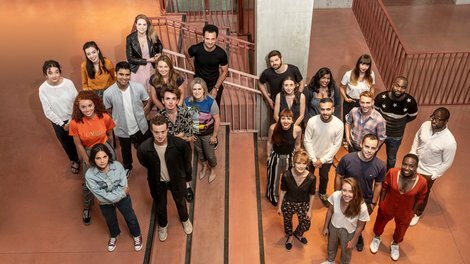 Film London are thrilled to announce that eight alumni have been selected for Screen International's annual talent showcase 'Stars of Tomorrow'. The showcase highlights up and coming actors, directors, writers and producers from the UK and Ireland. Carefully curated with the help of casting directors, talent agents, managers, producers and directors, the 'Stars of Tomorrow' is a well trusted indicator of emerging talent both in front of and behind the screen. Koby Adom, Baff Akoto, Amrou Al-Kadhi, Ameenah Ayub Allen, Prano Bailey-Bond, Moin Hussain, Johnny Kenton and Harry Lighton will join the ranks of previous 'stars' Charlie Covell (The End of the F***ing World), Pheobe Waller-Bridge (Fleabag, Killing Eve) and Sam Yates (The Hope Rooms) who have all gone on to receive tremendous mainstream success. The filmmakers will have their work presented at an event on Thursday 11th October during the 62nd BFI London Film Festival 2018. Interested in story-telling from a young age and later developing his interests in film and photography, Koby Adom studied at the London Film School. Koby considers his British-Ghanaian heritage essential to his story telling, aiming to represent both London and Africa through social and political issues. Koby's work has been screened at numerous festivals such as the London Short Film Festival and the Africa International Festival. Baff creates kinetic, colourful stories. Raised in London and Accra, Baff left school and found filmmaking at the age of 18 where he began in documentary, moving into scripted directing. In 2010 he joined the London Calling slate with short Starcrossed. Since then, he was named on the BBC New Talent Hotlist 2017 and is currently preparing to direct his first feature film- mentored by Asif-Kapadia (Amy, Senna) as part of the Guiding Lights feature talent program. Filmmaker, screenwriter, and director amongst many other attributes, Amrou Al-Kadhi is an emerging LGBT filmmaker. Amrou's shorts have achieved great coverage ranging from the BFI London Film Festival to OutFest LA Film Festival, BBC IPlayer and BBC 4. Tackling subjects surrounding LBGT people of colour and drawing from his own experiences, Amrou wrote and directed London Calling's Anemone which explores gender identity, family and religion for a young British-Nigerian teenager through marine life. Amrou is now focussing on his debut book Unicorn set for a 2019 publish. Producer Ameenah Ayub Allen has worked on various projects throughout her career, ranging from assisting to producing. She then became part of the 2015 London Calling Slate producing Above -19-year-old Niamh, just out of prison and returning to her baby girl, only to face bad blood with her own mum- winning a UK National Film Award for Best Short Film. Ameenah's success continued with 2017 documentary Erase and Forget gaining an Original Documentary nomination at the Berlin International Film Festival in 2017. Ameenah is currently in production with a new untitled film set for 2019 release. In 2010, Prano Bailey-Bond directed London Calling horror Short Lease, winning Best Short Film at The British Horror Awards 2010 and screening at ScreamFest LA 2010. With selections and wins at Woodstock, BFI London Film Festival, Women in Horror Festival and Aesthetica Short Film Festival, Prano has firmly established herself as a heavyweight in genre cinema- finding beauty in the strangest of places. Prano is currently working on her debut feature and psychological horror Censor in development with Film Cymru Wales, Creative England and the BFI. Writer and director Moin makes up the 2018 London Calling slate. His film Naptha; concerns a young man named Faraz who lives and works in a petrol station with his ageing father Malik. However, Malik's increasingly bizarre behaviour is causing them to drift apart. Moin's two other shorts- Holy Thursday and Real Gods Require Blood have received international reach, the latter premiering at Cannes Film Festival 2018 with from The British Council and BFI. Writer and director Jonny Kenton has worked on features, shorts, music videos and interactive content for clients ranging from Warner Brothers and Disney, to National Geographic and Channel 4. His films have also been screened at Raindance, Clermont-Ferrand, Venice and London Short Film Festivals. Most recently, Johnny directed an episode of hit TV drama Endeavour and has completed 3 shorts. Jonny's feature Night Dances reached the development stages of the 2014/15 Microwave slate. BAFTA nominated and London based writer and director Harry Lighton created critically acclaimed London Calling 2017 Wren Boys. The film received an immense amount of success, making selection at Sundance for the Short Film Grand Jury Prize the Grand Jury Prize Nominee at SXSW. Wren Boys also received a BAFTA 2018 nomination for Best Short Film. Harry's highly anticipated first feature, commissioned by BBC Films is in the pipeline.